A fanatstic location in York City Centre makes the Dean Court Hotel a 4-star option for classy weekend retreats in one of the coolest cities in the North. 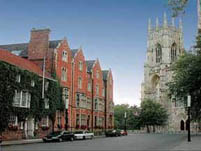 Located opposite York Minster. Lots of pluses here. You’ll find this rather handsome and rather solid looking gaff opposite York Minster just around the corner from the famous ‘Shambles’ shopping district with all its quirky Victoriana, boutique stores and curiosity shops. This 4-star hotel is a tasteful affair all round. Each of the 37 bedrooms is decorated to a high standard, and though traditional rather inspired, the flashes of colour amongst the cosy, warm creams give it a gentle boutique character. Wireless broadband is available throughout (free of charge) and there is a good selection of superior and standard rooms on offer. The rooms also come equipped with TV/DVD combo players. Has to be worth mentioning the dining options. Not only is there 24-hour room service, the onsite DCH Restaurant earned a well deserved AA Rosette for its tasty, innovative menus. There’s also a new air-conditioned new Cafe- Bistro.